Canberra's annual balloon fiesta for 2005. 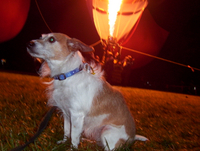 I took Nattie (my dog) for a walk early in the morning (5am) to see the hot air balloons. Last changed on 03/21/05. This album contains 9 items.